When I think about the Xbox One X and the current 4K gaming landscape, there’s always one title that comes to mind immediately – and that’s Forza Horizon 3. Its Xbox One X Enhanced upgrade arrived just over two months after Microsoft’s new 4K gaming machine shipped, and it immediately became my favourite showcase for the console and my newly-acquired 4K HDR display. To put it simply, Forza Horizon 3 is a 4K visual showpiece with excellent rendering techniques and a stunning implementation of High Dynamic Range, which adjusts the colour and overall brightness of the image to offer a more realistic, vivid look. Forza Horizon 3 is still my favourite go-to 4K gaming experience. From its vast, lush open-world incarnation of the land down under to its incredibly-detailed roster of cars, not to mention its dazzling lighting effects and authentically-captured skyboxes, there’s something special about how this game delivers its open-world driving experience. It’s fair to say Forza Horizon 3 really is the definitive showcase of your 4K HDR display at this moment in time, but there’s a new contender in town ready to surpass it – and to no real surprise, it’s the follow-up to Playground’s already established and perfectly wonderful open-world racer, Forza Horizon 4. After spending more than two hours with the successor to one of the best open-world driving games of this generation, I can safely assure you that Forza Horizon 4 is the new definitive Xbox One X showpiece that we’ve been waiting for. However, this isn’t just in terms of visuals, but also performance. Whilst the Xbox One X Enhanced treatment for Forza Horizon and Forza Horizon 3 focused on the 4K experience alone with enriched visual fidelity, this time the team over at Playground Games has crafted a surprising 60FPS mode for Forza Horizon 4. In terms of consoles, this optional mode is naturally exclusive to the Xbox One X, but it’s there – and it’s locked at a blistering, silky-smooth 60FPS refresh rate. The target resolution of this mode comes in at a native 1080p, confirmed to me by Playground’s Creative Director Ralph Fulton in an interview at the McLaren Technology Centre, where we also had our hands-on session with the game. It’s not overly surprising that Playground decided to lock-in at 1080p for its performance mode in Forza Horizon 4. It’s the ideal expectation for a 60fps open-world experience on console but given how long it took the developer to confirm the resolution of this mode, I’d expect the team were initially targeting a 1440p experience with a locked 60FPS. But it’s important to remember that this is Forza, and one of the key pillars of the franchise has always been to deliver a locked, uncompromised and stable experience on console hardware. Whether it’s a buttery-smooth 60FPS in the Forza Motorsport series, or 30FPS in the open-world Forza Horizon series. That same ideology applies to both of Forza Horizon 4’s Xbox One X modes. The ‘Graphics’ mode delivers a native 4K experience locked at 30FPS, whilst the ‘Performance’ mode offers a stable 60FPS in gameplay with a downscaled resolution of 1080p. With time logged into both experiences, there’s no denying how excellent they each are – and the choice for some players might be troublesome. 1080p TV owners will naturally be best opting for the ‘Performance’ mode since it’s a perfect pixel-match for their display, whilst offering the smoothness of 60FPS gameplay. 4K TV owners will have to choose between whether they want a perfectly crisp image to match their display, or else sacrifice clarify for the benefit of that slick, fluid gameplay experience. From initial inspection, they both offer the same visual quality outside of resolution, such as in textures, foliage and car models. It’s the resolution that takes the most noticeable hit when you aren’t playing in the ‘Graphics’ mode, and even then, those opting for the ‘Performance’ mode should still receive superior visuals to those on a base Xbox One or Xbox One S console, backed by the benefit of that 60FPS experience. Regardless of which of these modes you choose, you’re in for a treat. The framerate is solid based on our experience, and the visual clarity is simply immense. Whether it’s the silky-smoothness of 60FPS or the pristine quality of 4K, there’s no denying how beautiful and incredible Forza Horizon 4 looks on the Xbox One X. This game is a real luxury for the eyes to take in. 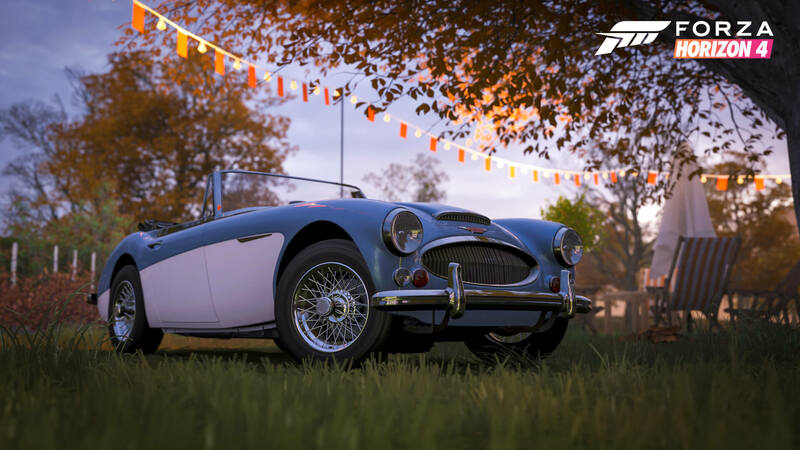 From the beautiful sights of Britain to its ever-changing skies and seasons, Forza Horizon 4’s visuals flourish from the moment you pick up the controller. 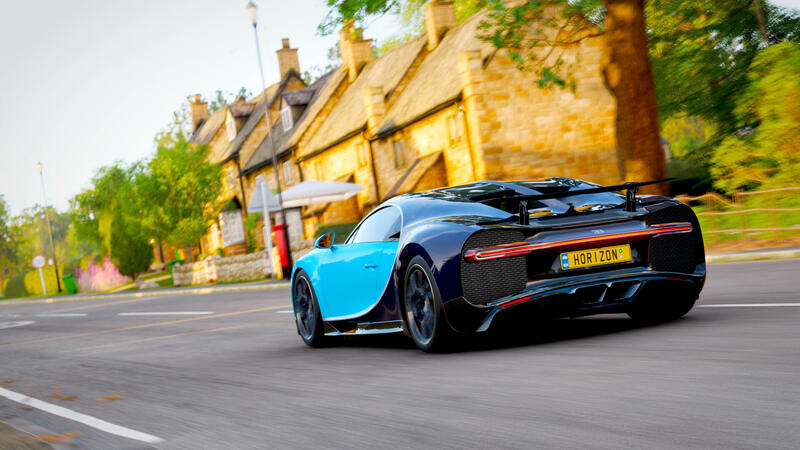 The introduction screen shows the game’s cover star, the McLaren Senna, driving across different landscapes of beautiful, historic Britain in all four seasons. Following that is the game’s introductory experience, which is the same demo that has been shown at events like E3, Gamescom and PAX. This snippet introduces you to all four seasons in Forza Horizon 4 whilst letting you take control of different types of cars to match different surfaces. My favourite scene from the introduction occurs when driving the McLaren Senna down the twisting and beautiful roads of Britain. Those Autumn skies shine immensely, and the orange hue it delivers upon the world is just spectacular. This season is certain to be a favourite for Photo Mode opportunities, but Winter also has a unique visual flourish to it you don’t find at any other time of year. Spring feels fresh, crisp and exciting, whilst Summer delivers the same impressive visual feats we come to always expect from the Horizon Festival. Glorious sunshine with plenty of life in the atmosphere. No matter which season you’re playing, Forza Horizon 4 will look spectacular – and this introductory segment is not only an incredible way to introduce you to the game and its new seasonal landscape features, it’s also a pure showcase of the visual accomplishments Playground Games have delivered for its latest open-world racer. From the leaves that scatter the road in Autumn to glaciers hanging off ridges in Winter, not to mention the evergreen colour of trees in Summer and the wet, crisp atmosphere of Spring, it’s incredible to see how seasons adapt and change Forza Horizon 4’s landscape to deliver a purely authentic and rich experience. This is the best of each season, and they’re all brought to life wonderfully on the Xbox One X. HDR will also make the colours of each season really come to life, from the environments to the skyboxes above. Autumn offers a reddish hue with its pale coloured trees and orange-tinted environment, whilst Summer sees deep blue skies with cloud trails in the atmosphere followed by the coloured smoke from jets flying above you as seen in the game’s introductory sequence. Forza Horizon 4 has been built with technologies like 4K, HDR and 60FPS in-mind, and the Xbox One X has the horsepower to deliver all of it. The integration of seasons into the ForzaTech engine is undoubtedly a technical marvel, but the execution of it in-game is simply wonderful and immerses players into the world of beautiful, historic Britain. Forza Horizon 4 features a variety of spectacular locations that shine when brought up to 4K resolution. 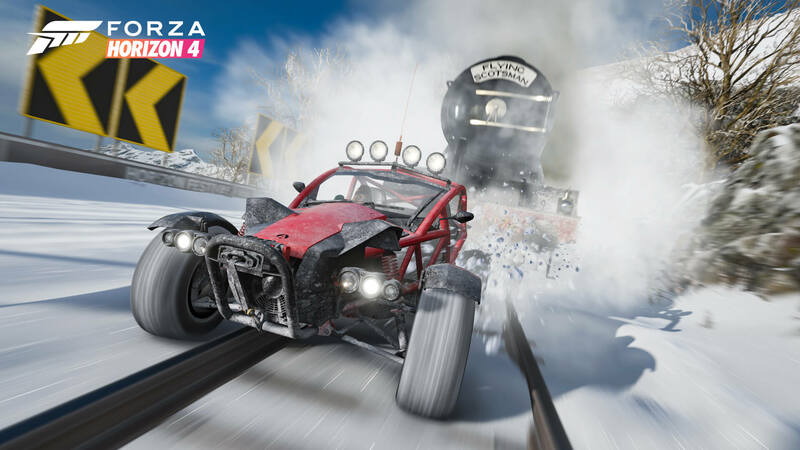 Whether you’re trailing down the beach towards Bamburgh Castle, racing through deformable mud at Mudkickers Adventure Park or driving through the old architecture and city buildings of Edinburgh, these are all brought to life so elegantly in Forza Horizon 4. The addition of deformable mud is obviously new to the series and is somewhat reminiscent of the Spintires experience. Be it a truck made for off-road driving or a supercar that’s typically meant for the streets, there will be track marks left in the mud as you plough right through it. Not only is this a great visual feat in Forza Horizon 4, but it’s also an excellent addition to the gameplay and simulation model of the ForzaTech engine. It’s one of many upgrades that features in the new game that help make it a step above its predecessor. Another example is the updated tree language in forests and countryside when heading off-road. Trees that can be dismantled are easily distinguished now from those which are solid, and it makes driving through forest environments far more enticing and enjoyable than before. The Lakehurst Forest in Forza Horizon 4 is full of trees, flowers and wildlife that change and evolve as seasons progress. Buttercups, lilies and blossoms scatter the foliage-covered ground as trees encompass the landscape. Naturally in Winter, these will become withered and barren, but by the time Spring rolls around, they’ll flourish and showcase the natural beauty of Britain in Forza Horizon 4. You must certainly compliment how Playground Games have depicted the natural evolution of the world in each passing season. It’s truly a testament to both gameplay design and technical achievement, and it all plays so wonderfully in the game – whether you’re enjoying it in native 4K or 60FPS. Forza Horizon 4’s enhancements on the Xbox One X extend beyond resolution and performance, however. The lighting model for the game has been upgraded with new true shadow casting lights from both cars and the environment – a visual feat that’s exclusive to both Microsoft’s latest console and high-end Windows 10 PCs. These new shadow casting lights render into the bodywork of cars and reflect out of the materials in a more realistic manner than before, allowing you to see all the shiny pings that come off the metalwork. The upgrades made to lighting also apply to flares, street lamps and reflections within the environment – and there’s even been up-lighting added to major monuments like castles. Combined, it means a more realistic, eye-catching lighting model that feels more alive than in past titles, and it’s something all Forza Horizon 4 players on Xbox One X should appreciate. The render distance and level of detail is also another area where Playground’s newest racer impresses when played on Xbox One X. You can literally see for miles. Whether it’s the mountains of the Scottish Highlands ahead of you whilst soaring down a road at top speed or the vistas that overlook the entire landscape of Britain, these scenes are simply beautiful and incredibly detailed. Like the Forza Horizon 3 Xbox One X Enhanced upgrade, there’s far more richness in the world with the game’s expanded draw distance, and it results in an environment that feels like it sprawls endlessly. It means photographers are also in for a treat with this one. There’s so much beauty to capture in Forza Horizon 4, and with wildlife now roaming the fields, forests and hillsides, it means you can take photos of animals with your car – or just the animals alone. If you want to capture yourself attempting to chase sheep down a field, then you can do it. Like the character models and of course, the cars themselves, the animals have been well-detailed in Forza Horizon 4 and their addition feels natural in the world, responding to your car very swiftly should you begin to approach them. They’ll also change based on the season, as sheep will be sheared once you arrive into Summer, and of course, different animals will appear at specific times of the year. 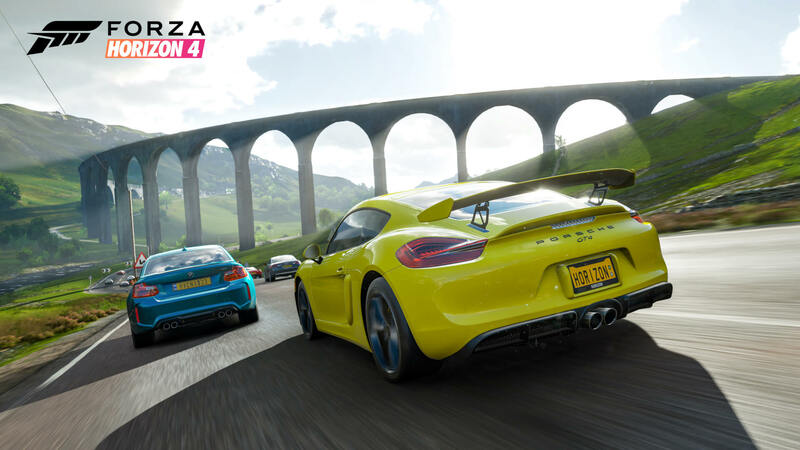 Overall, Forza Horizon 4 on the Xbox One X hands in yet another visual masterpiece for the franchise – and I can tell you here and now that it most certainly hasn’t been downgraded or massively altered from its initial E3 showing. 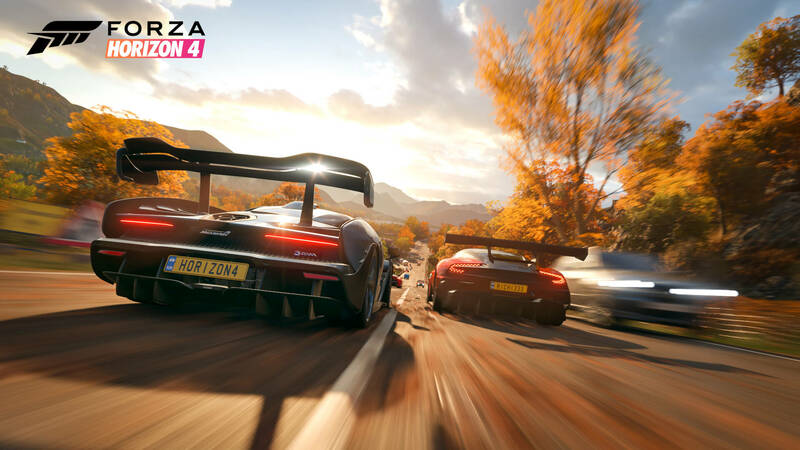 Whether you’re playing in the ‘Graphics’ mode for that native 4K visual experience or opting for smoother gameplay with the ‘Performance’ mode, Forza Horizon 4 is the new definitive showcase of the world’s most powerful console that’s available on store shelves today. But it’s not all about visuals and framerate however, as Forza Horizon 4 also delivers an incredible audio experience too. It’s the first Forza title to feature the inclusion of Dolby Atmos surround sound, and it’s amazing. 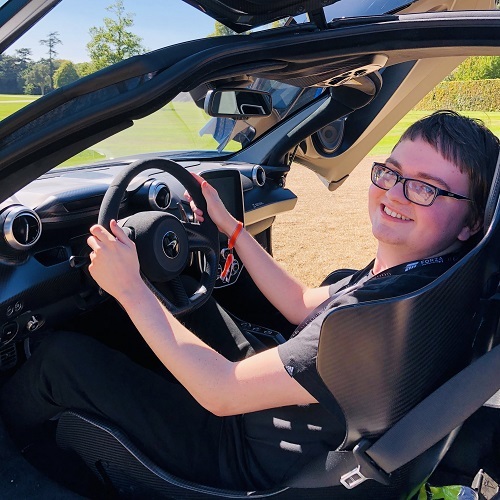 From roaring engine notes ripping it down the motorway towards Edinburgh to the blistering atmosphere and sound of the Horizon Festival, the inclusion of Dolby Atmos immerses you even further into the experience – and it results in fantastic audio quality for everyone. Between all of this, I can’t wait to get behind the wheel of the McLaren Senna and experience Forza Horizon 4 on my 4K gaming setup, it’s just going to be tough to figure out which of the two modes to use, but as a graphics aficionado, I’ll certainly be taking advantage of the native 4K mode. That doesn’t mean I won’t be playing in 60FPS either – it’s far too good to completely ignore, so I imagine I’ll regularly switch between these modes, as will many others, but if you do stick to one for your duration on the game, then I can tell you this much – you’re in for a treat. Forza Horizon 4 is gorgeous across all modes and platforms, whichever one you choose to enjoy the most, however comes down to your own personal preference and taste.